NaNo fame is apparently something I have now. - Adding chaos to the world, one thought at a time. NaNo fame is apparently something I have now. I went to Atlanta Streets Alive with a friend from Reddit today. It was a lot of fun, but the event itself isn't what I'm writing about here. I spotted a poetry on demand table at some point on North Highland Avenue, and won't lie--this was what I was looking forward to for the past day. These were the folks from Free Poems on Demand, and indeed, they would write a poem on the topic of your choice. 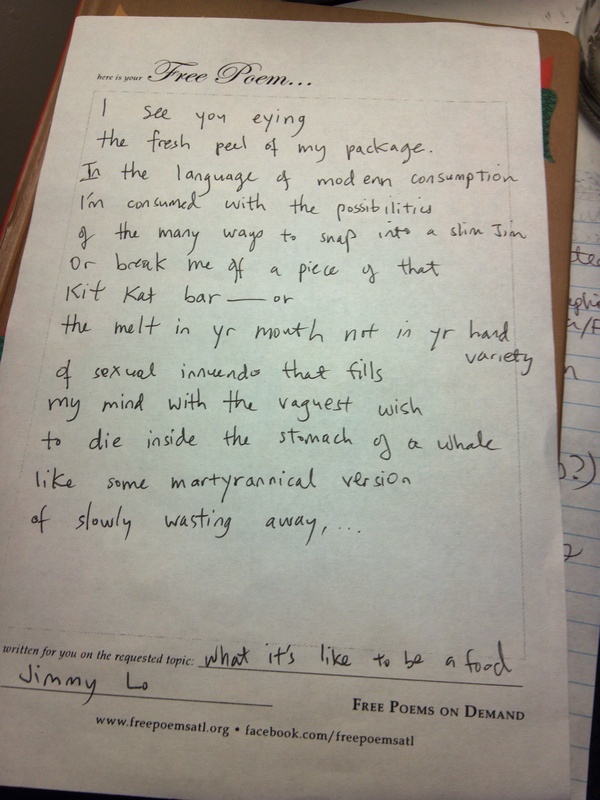 So I went up to them and after struggling to come with a good topic, requested a poem on what it's like to be a food. One of the poets noticed my NaNoWriMo messenger bag and we started talking about NaNo. I mentioned that I had done and won NaNo for the past ten years, and he asked what my username on the site was. I told him. "Sushimustwrite," he said. "I've heard of you." Yep, pretty much my reaction right there. I got used to being recognized in my region and even at Night of Writing Dangerously, but out in the general public? Whoa, dude. I honestly don't know what to think. The rest of the day passed. We wandered around, found the park in my neighborhood, wandered around more, and went to our respective homes. I came home, ate, and checked my email, Twitter feed, and NaNoMail. And found multiple messages in my NaNoMail that are best classified as fanmail. So hi, apparently NaNo fame is apparently a thing I have now. And by the way, here's the poem. the fresh peel of my package.